The Olympia School Board regularly recognizes students, staff and community members for a wide variety of accomplishments and recognitions. 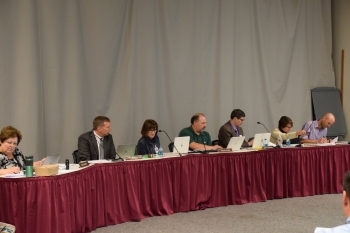 Highlights from school board meetings are featured below. Many of these highlights are also featured on the district's social media pages, including Facebook, Twitter and Instagram. Be sure to like or follow the district on the various social media platforms to get news as it happens! Joined by family and friends in the audience, the three newest school board directors elected in November took their official oath of office. Directors Scott Clifthorne, Leslie Huff and Hilary Seidel recited the oath of office led by outgoing Board President Eileen Thomson. As is customary every December, the board also elected officers for the coming year. By unanimous vote, the board elected Frank Wilson president and Joellen Wilhelm vice president. Wilhelm will also serve a second year as the board’s legislative representative. Superintendent Patrick Murphy, the board, and the audience also bid a fond farewell to outgoing Director Eileen Thomson, who left the meeting after the new directors finished taking their oath of office. Thomson received a standing ovation and hugs from her fellow board members for her years of service to the Olympia School District. Additionally, the board recognized Marshall Middle School staff, students and community for being recognized as a 2017 School of Distinction for being among the top 5 percent of highest improving schools statewide. Olympia High School Academic State Champions: Varsity Girls Swimming Team, coached by Mel Smith, and Varsity Volleyball Team, coached by Laurie Creighton. Capital High School Class 3A Volleyball State Champions, coached by Katie Turcotte. Jan Kiefer, head coach of the Capital High School Dance Team, inducted this fall into the Washington State Dance & Drill Coaches Association Hall of Fame. 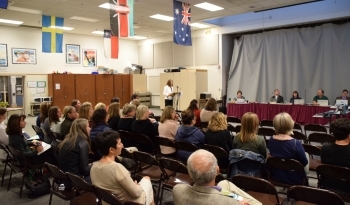 A reception for outgoing board members preceded the start of the regularly-scheduled board meeting at the Olympia Regional Learning Academy (ORLA). Guests were invited to enjoy appetizers while visiting with outgoing board members Eileen Thomson, Justin Montermini and Mark Campeau and their families. A slideshow of images showing the board members over their years of service on the board projected on the screen during the reception. The meeting opened with a special recognition of the three outgoing board members. Superintendent Patrick Murphy called each of the outgoing directors forward to honor them for their service and presented each one with an engraved plaque, a certificate of recognition and a copy of their school board portrait. Murphy also surprised outgoing Director Mark Campeau by presenting him with an honorary Capital High School diploma. Marilyn Dye, delivery driver with Child Nutrition Services. She has worked for the Olympia School District since 1990, when she was hired as a bus driver. In the 2008-09 school year, she held some temporary positions as custodial, grounds (warehouse distribution) and mail delivery in between her bus driving. In 2009, she became the food service delivery driver and has held that role ever since. Michell Orwig, paraeducator at Garfield Elementary School. She has worked as a paraeducator at Garfield Elementary since 2005. Carolyn Poage, head custodian at Olympia High School. She has worked in the Olympia School District since 2003. In those 14 years, she has been a substitute custodian, a swing custodian, and a Head Custodian. Heard a presentation about ORLA by Principal Celeste Waltermeyer. ORLA students also performed a musical selection on stage. Approved the 2017-18 school board meeting schedule. Jennifer Priddy, assistant superintendent of finance and operations, and Kurt Cross, director of capital planning and construction, updated the board on the status of current and planned capital projects throughout the district. Cross introduced Trent Hart, of Tovani Hart Architects. Hart reviewed the plans and timeline for the remodel of The Olympian building in preparation for the move of the district administrative offices. Cross and Jim Walsh, of BCRA Design, presented educational specifications for the upcoming modernizations at Centennial, McLane and Roosevelt elementary schools as required by the Office of Superintendent of Public Instruction (OSPI) for the School Construction Assistance Program. Centennial Elementary School Principal Shannon Ritter welcomed the school board and introduced staff members who filled the audience for Ritter's presentation at the school. Ritter shared about staff and students, building-focused collaboration, achievement data, progress monitoring, interventions, celebrations, and more! The mission of Centennial Elementary School, she said, is to ensure high levels of learning for all. The school's vision is to strive to promote curiosity for learning. The Olympia School Board welcomed two representatives from Capital Region Educational Service District (ESD) 113. Superintendent Dana Anderson, and Al Cohen, a member of the Board of Directors representing District 4 (Olympia and Griffin school districts), updated the school board on programs and services offered to member districts. The board approved a proclamation recognizing the October as Walk to School Month in the Olympia School District. Board President Eileen Thomson read aloud the proclamation, which says in part that "walking or biking to school offers an opportunity to build activity into a child’s daily routine, improving health and increasing students’ readiness to learn in the classroom." The proclamation goes on to say that "parents, school employees and community leaders can make a lasting impression among our community's youth by modeling fun, safe, and healthy behavior by accompanying students on Walk to School events."